Can you believe that tomorrow is the first (official) day of summer? Where does the time go? In honor of the summer solstice, I have put together a packing guide for Europe in the summer, since that’s when most Americans travel across the pond. When traveling in Europe in the summer you are pretty much guaranteed it is going to be warm and even scorching in places like Spain, Italy, and Greece. Northern Europe can be the exception to the rule, although I have found you really don’t know what to expect with England! That’s why I always pack at least one sweater and a rain coat… just in case! Rain Jacket – A light-weight rain jacket is all you need for summer showers. Northface shells are great because you can roll them up and keep them in the bottom of your bag. For more northern climates, you might opt for a slightly heavier rain jacket (I love my Barbour Shore jacket… it has a lighthouse printed inside!). Umbrella – A travel essential for all seasons! Comfortable and Quality Sandals – Touring European cities is no easy task and you will want something study, supportive, and comfortable for standing in museums and trekking across town (foot discomfort is no fun when you travel!). A good pair of sandals can be as comfortable as sneakers but look nicer with dresses (no one likes the tourist dress with tennis shoes look). Sneakers or Espadrilles – If I am going to wear sneakers, I like low-profile sneakers like Vans or Toms over athletic shoes, and I love espadrilles! They basically go with everything and are super comfortable! Hat – Protect your skin and hair from the sun with a great hat. Panamas are my preferred hate for travel! Sunnies – Just like your skin and hair, your eyes need protection. Plus a great pair of sunnies hides sweaty summer skin! My rule – if you look bad in a photo, your sunnies aren’t big enough! Scarfs – Like umbrellas, scarfs are a travel essential for every season. They can transform an outfit and you can keep one in your purse to ensure you are always church appropriate (i.e. you can quickly tie it over your shoulders or around your legs). Nylon Bag – I love nylon bags for travel, they are light weight and supper durable. And of course, Longchamp is the king of travel nylon bags (I mean they fold up!). Light-weight Tees – I love traveling with cotton-linen blend tees. They are breathable and comfortable. Sleeve Options – Make sure you pack a variety of sleeve lengths to cover all weather possibilities and dress codes. Neutral Colors – Tees and tanks in neutral colors will match everything. A Unifying Color – This is the key to versatility. Make sure everything matches (or goes with) one color. For me, this is navy (#navyornothing). Summer Dresses – Cotton-spandex dresses in solid colors are excellent summer travel staples. They can easily be dressed up or down for any occasion. Shorts – Shorts are great for warm days, but be warned they aren’t appropriate for visiting churches and cathedrals (these pull-on shorts from J.Crew are supper comfy!). Finally add some interest to your basics and essential items with some great pops of color (I am really loving yellow lately), diverse textures (like linen), interesting patterns, and shiny metallics! Finally, don’t forget your swimsuit and cover up (and sunscreen of course) for Mediterranean beaches! What are your summer packing essentials? 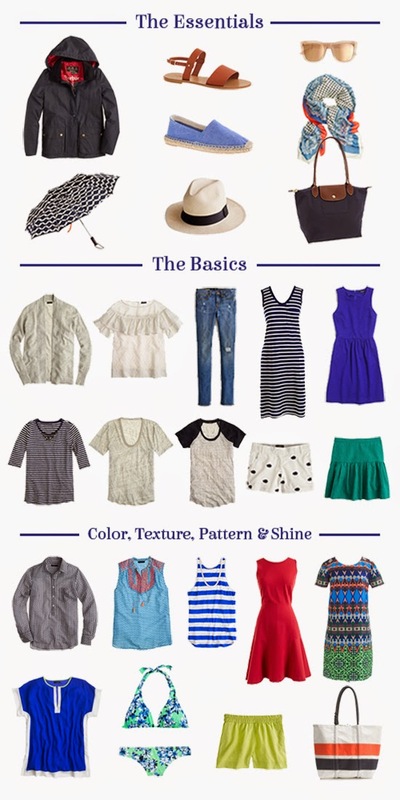 PS – click here for my Spring Packing Guide, and here for my Winter Packing Guide! next article: Berlin or Bust!